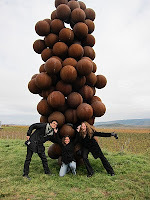 2010 marked my fourth year as a wine blogger and it was filled with highlights of travel, friendships, and spectacular events. In early 2010, I enjoyed the delicious abbondanza of Vino 2010, an elaborate Italian wine festa at the Waldorf Astoria, where I waded through rooms full of Italian wine producers and enjoyed not one, but two, talks, by Anthony Giglio and managed to waltz across to Cipriani’s for Luca Maroni’s SensofWine on the same day. At the end of the month, I bade a fond farewell to Italy-bound, Vineyard Adventuress Robbin Gheesling, and, along with Rob Bralow and Matt Sitomer and a few others, helped her finish off about nine bottles of vinous wonderfulness from her well-filled wine refrigerator (which I later took off her hands). 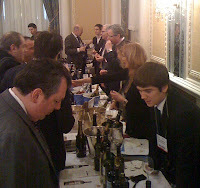 With spring came wine festival season, and I made the acquaintance of George Wilson and the gang from the St. Michael’s Winefest. After numerous emails and cell phone conversations on the fly, I was standing on board the Patriot on a fine May evening, gliding onto the Chesapeake Bay as I presented five wines during a lovely wine and food pairing cruise. 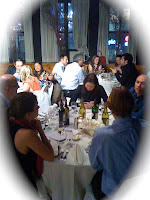 Also in May, was TasteCamp 2010, the second such blogger get-together that serves as a foil to the larger North American Wine Blogger Conference. Organized by the indefatigable Lenn Thomson, this year’s Taste Camp brought a few dozen bloggers (including my dear friend Melissa Dobson) and their significant others to the lovely Finger Lakes region in upstate New York for austere Rieslings and some very good Pinot Noir. My favorite visit was our last, to the small and welcoming wine cave of Heart and Hands Winery: their Pinot Noirs offered delicate fruit and earthy flavors – a lovely treat for someone with an old-world-leaning palate such as myself. In June, the spirit of adventure turned me towards Europe again. During an hour long phone call from Rome, Robbin and I hatched the plan that I should come visit her in Amalfi. I’ll never forget our first stroll up the promenade to her favorite bar for a Spritz, an aperitivo comprised of Aperol bitter orange liquor, club soda and white wine. Nibbling on a bowl of nuts and watching the sunset over a steel blue Mediterranean, I couldn’t have been more content. After zipping up and down the Amalfi coast on scenic ferry rides and scary bus rides--visiting the Marisa Cuomo winery, Pompeii and Positano--I left Italia for France, where I had signed up with Vitivinitours for Le Weekend des Grands Amatuers in Bordeaux. On my first evening, I had the pleasure of dining with Jane Anson, her husband Frank, and a few of their fellow British ex-pats. We ate fresh oysters and drank (of all things) Prosecco on a picnic bench with a view of the Garonne River. Another magical evening of wine and friendship. The next night proved how very small the wine world is, when I ran into Gregory Dal Piaz, the editor at Snooth and a New York City friend. Proving “there are no coincidences,” he and I were booked on the same trip that evening, an enchanting jaunt to Chateau Guiraud for a multi course dinner of superb cuisine and Bordeaux wines, ending with the Chateau’s own spectacular Sauternes. Later that month, I faced a sore disappointment when I missed my flight to the west coast for what would have been my third North American Wine Bloggers Conference. 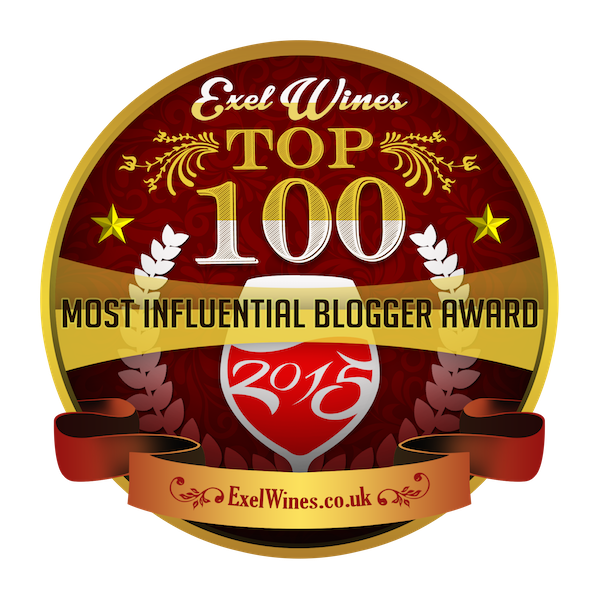 I consoled myself by drinking a cult Cabernet Sauvignon and following the action on Twitter. The summer saw some lovely get-togethers with other wine bloggers including the talented chef, Eric Guido, and two lovely NYC-based women of wine, Sasha Smith and Susannah Gold – hope to see all of them soon. And at a swanky Sonoma in the City event, I had the pleasure of meeting Carlo Devito, a wine-loving writer, blogger, and editor. In September, I was honored to be one of the bloggers invited to cover the Saratoga Wine and Food and Fall Ferrari Festival, where I was happy to catch up with my former teacher, Kevin Zraly, a man whose wine knowledge and charisma know no bounds. As the leaves began to turn on the East Coast, my thoughts turned to Europe again, this time for a trip to Austria for the European Wine Bloggers Conference in Vienna. My last few trips had been to Italy, France, and Spain, where the lilt of Romance languages filled my days. Now, I was bound for the eastern fringe of Western Europe's traditional boundaries, where the hard “g” and clipped, mutli-syllables of German hold sway. I had traveled solo to Austria in my 20s and was eager to return to this majestic world capital. EWBC felt like coming home in a way, as dozens of the friends I had made in 2009 in Lisbon were on hand again, including the lovely and intensely energetic, Gabriella Opaz. I cannot begin to describe the comradery and joie de vivre we wine-loving compatriots share, especially my wickedly clever pals, Denise Medrano and Andrew Barrow. This year, I made more friends: the witty Alistair Bathgate, the enthusiastic Eamon FitzGerald, the earthy and wonderful Caroline Henry, the well-liked-by-all wine student Prateek Arora, , and the swarthy Spaniard who lent me his arm for a waltz, Esteban Cabezas. I was also happy to hang out with my favorite Portuguese winemaker Oscar Quevedo, and, naturally, to drink some of his family's delicious port. From Austria, I took a memorable train ride with Luiz Alberto, who accompanied me on my first foray into Eastern Europe: Budapest. There I was hosted by the gracious couple Carolyn and Gabor Banfalvi, who opened their home to me and fellow EWBCers, including the always intriguing Sam Ockman and two more Budapest dwellers, the charming Molly Havorka and her dynamic husband Zoli Piroska. After two whirlwind days in the enchanting land of Tokai, I finished my Hungarian trip with a private lesson at the Central European Wine Institute at the invitation of another new friend, Gabor Patko. 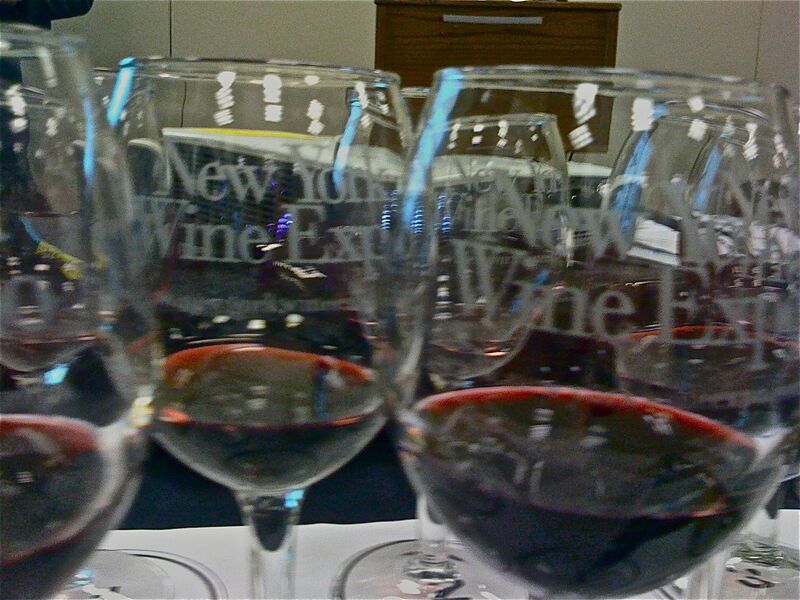 As the cold weather swept into New York City, I began my next adventure in the world of wine: enrolling in the International Wine Center, the New York City branch of the internationally-recognized Wine and Spirits Education Trust, where I am applying myself diligently to the study of wine. 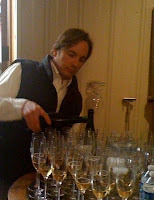 Thanks to everyone who made 2010 such a wonderful year of exploring new wines, new lands, and new adventures. I raise my glass to you. I'm sitting in my hotel in Bordeaux, exhausted and exhilarated by the last few days of events of Le Weekend des Grands Amateurs. It's a weekend for wine lovers, not professionals. Today as I sat next to Chateau Branaire-Ducru co-owner, Patrick Maroteaux, at a delicious four course lunch, he told me, "It's very important for the winery owner to be open to wine lovers.". It's not surprising that Mr. Maroteaux was one of the founding organizers of the weekend, now in its fifth year. The weekend started yesterday morning with a six and a half hour grand tasting on the river walkway near Chartrons, a historic wine merchant district. I have never tasted so many wines from exceptional houses all at once: Chateau Angelus, Chateau Giscours, Chateau Beychevelle, Chateau Talbot, Chateau Lynch-Bages, Chateau Pichon-Longueville, more than 100 in all. 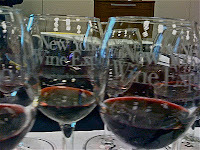 I myself tasted 75 wines, the majority with notes. It took me four and a half hours with three breaks, and only bread & cheese to sustain me. Of course I didn't drink all that wine. I and the vast majority of attendees made good use of the silver pedestal spitoons, which were emptied frequently. My favorites included: 04 Chateau Canon-la-Gaffeliere 04, 03 Chateau Dassault, 01 Chateau La Tour Figeac (all from St. Emillion ); 02 Chateau Beauregard, 01 Chateau Petit Village, and most of the 07s from Pomerol; 03 Chateau Brane-Catenac, 02 Chateau Dauzac (Margaux), 02 Chateau Lynch Bages & Chateau Pontet-Canet (Pauillac). Dinner last night was at a beautiful Sauternes wine estate, Chateau Guirard. Its drive is striking, lined with tall trees. One of the owners, Xavier Planty, greeted us warmly & cordially hosted another elaborate meal that lasted four hours. Today, the last event was a wine tour. I chose the Medoc, legendary red wine region on the left bank of the Gironde River. 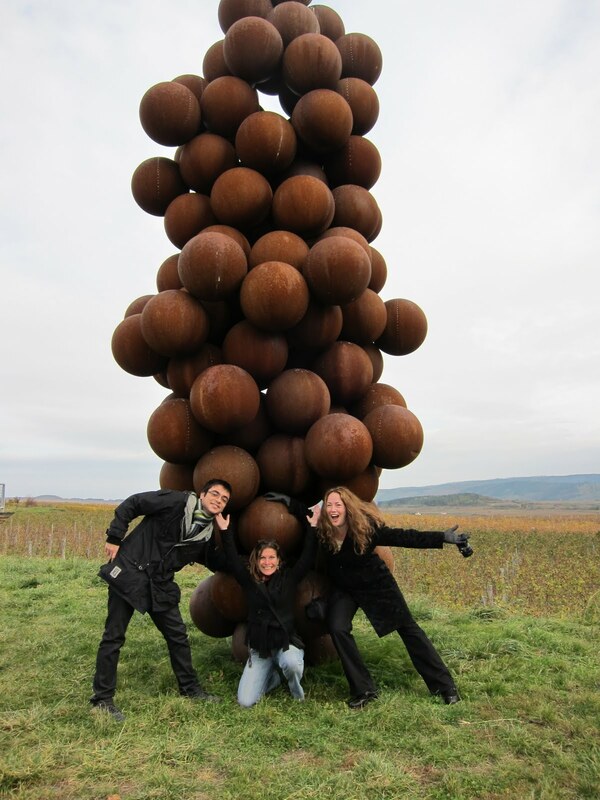 In addition to lovely tastings & gracious winemakers, the tour was also higly enjoyable because it offered the chance to meet & mingle with an international assortment of wine lovers. On the bus back to Bordeaux, I befriended French, Swiss & British wine lovers. And that was one of the surprise benefits of the weekend: sharing it all with my fellow amateurs.